Nick Newell’s inclusion in this report will probably receive its fair share of ridicule and disbelief. Yet, it is astonishing how many people are simply dismissing the skill and heart that Newell has shown throughout his MMA career and life just to get this point. Newell has gained worldwide MMA attention for fighting with just one full arm. He recently signed with World Series of Fighting after previously winning the XFC Lightweight title against Bellator veteran Eric Reynolds. Newell was born with a left arm that barely expanded past his elbow. This condition is known as congenital amputation. Athletic prowess was not something most people envisioned for Newell, but he gave high school wrestling a try. After some early setbacks, Newell was able to find success and went on to wrestle at Western New England college where he slowly began to realize that MMA was a real possibility for him. Newell made his amateur MMA debut in 2008, eventually winning a championship in the National Amateur Fight League. Newell moved on to make his official pro debut in 2009, winning his first fight via TKO. He quickly submitted his next 4 opponents though it should be noted that the combined record of his opposition was a paltry 6-24 overall. Despite being largely untested, Shark Fights signed Newell to a contract. Newell was set to make his Shark Fights debut against his toughest opponent to date in Jesse Zeugin, but Newell was forced off the card due to a staph infection. Newell never ended up fighting for Shark Fights, though he was soon picked up by Xtreme Fighting Championships (XFC). Newell won his XFC debut in highlight-reel fashion, submitting Denis Hernandez via heel hook. The submission win brought Newell a ton of extra exposure as his victory was featured on Inside MMA. In his next fight, Newell took a step up in competition as he faced 5-1 Chris Coggins. Newell was unable to find the submission early and struggled throughout the rest of the fight, barely edging Coggins via majority decision. The buzz around Newell seemed to fall off considerably after people were able to see his limitations. Newell on the other hand, did not sulk, he knew he needed to make changes to reach the next level, so he brought his skills to American Top Team in hopes of rounding out his overall game and conditioning. Newell made his XFC return with a vengeance, shockingly knocking out Adam Mays with a perfectly placed knee strike. The MMA world took notice once again as Newell continued to shock his naysayers into somewhat believing his skills could live up to the test of stiffer competition. That stiffer competition was on its way to Newell’s doorstep as XFC decided to offer Newell a title shot against Bellator veteran Eric Reynolds. Reynolds’ only career losses were to solid competition, and he had a penchant for avoiding submissions, evidenced by his recent decision win over BJJ wizard Jonatas Novaes. 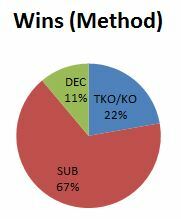 Newell was nearly a 3:1 underdog coming into the fight, but unfavorable odds were something that Newell had been overcoming for his entire life. In just 1 minute and 22 seconds, Newell was able to take Reynolds’ back and submit him via rear-naked choke to win the XFC’s Lightweight Championship. Newell once again received a whirlwind of support and recognition that started to move beyond the MMA world and towards mainstream attention. Even UFC President Dana White was asked more than a few times if he was willing to give Newell a shot in the UFC. Despite Newell’s hope to sign with the UFC, the fairly tale opportunity did not come true. Instead, Newell had to start preparing to defend his XFC title, but upon hearing that the XFC wanted to match him up with fellow prospect Scott Holtzman, who was largely unknown to fans, Newell started to question the XFC’s willingness towards building him up into a star, who would eventually move on to the UFC. The XFC argued that Holtzman was their #1 contender. The clash of heads started to play out in the media, which is never an ideal situation for either party. In the end, Newell was allowed to sign with the upstart World Series of Fighting. He is set to make his debut against TUF 12 alum Keon Caldwell. Newell primarily trains out of Fighting Arts Academy, which is located in Massachusetts (Newell’s home state). He recently traveled south and began training at American Top Team, which has perennially been one of the top 10 gyms in the world. The results of Newell’s training at ATT are very noticeable throughout his last 2 fights. He seems much more comfortable with his striking and overall footwork in avoiding striking attacks to his left side. By training at ATT, he not only trains under world class coaches, but has access to an immense number of high-level training partners. So, based on what I have read in the comments section of most Newell articles, videos, and threads, there is an unbelievable amount of people who want to see Newell fail, so they can tell others, “I told you so.” Most of these types don’t understand that Newell has trained nearly his entire life in wrestling or MMA, and has not only adapted in competing with congenital amputation, but in a way, has made it into a weapon. The obvious weakness is that Newell can’t block or fully throw punches from his left side. If an opponent throws a high kick, Newell has no way of blocking it with his arm, so why haven’t his opponents knocked him out yet? Mainly because Newell is an extremely cerebral fighter. He already knows opponents are going to be gunning to attack his left side. Newell counters this by continually pushing the pace and making his opponents backpedal, rather than come straight at him. He understands how to fight without a full left arm better than his opponents know how to attack a guy without a full left arm. Now the real question becomes, what happens when Newell starts facing UFC-quality competition? It won’t be easy, and it’s likely going to come down to matchups. If Newell faces a wrestler with great takedown defense and decent striking, he’s likely not going to come out the winner. Yet, there are matchups that Newell can win at the lower levels of the UFC’s Lightweight Division. Newell’s last opponent, Eric Reynolds, was no pushover. He wasn’t exactly at an elite level, but he was tough and certainly could have won a couple fights in the UFC. I’m not trying to play MMA math, but the fact is that Newell went out and submitted Reynolds in under 2 minutes. There’s no denying it, Newell has continually stepped up to the plate as the challenges have grown stiffer. Newell is not a world beater, but he is an odds beater. He’s likely not going to be a Top 25 fighter because higher level opponents are going to be able to expose his condition. Yet, there’s about 15-20 fighters that come through the UFC every year, and are in and out of the company in a matter of 2-3 fights. I think once Newell gets himself in, Dana White will see the dollar signs and start believing a bit more in Newell’s skills. 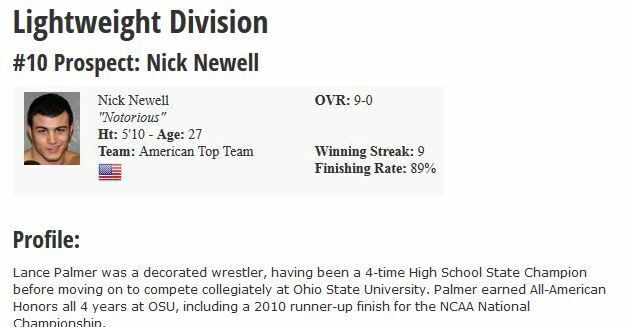 In conclusion, Newell made this report because he’s 9-0 with a win over a solid veteran in Reynolds. He trains at American Top Team, who are going to continue and make him a better fighter. More than anything though, Newell has a desire to succeed, especially when it comes to MMA. He could have picked a much easier profession, one without the spotlight, where his condition would not be viewed as such a disadvantage, but he didn’t. He’s here to prove the naysayers wrong. He’s here to prove that he deserves a fair shake just as any other 9-0 fighter would. Newell knows it’s going to be an uphill battle convincing fans to believe in him, but that’s just the way he likes it. It’s what fuels his fire to prove to everyone that doubting him is a mistake.